Eagles executive vice president of football operations Howie Roseman said Monday that he feels the team added talent this offseason, but are also keeping in mind that they have a quarterback they “want to pay" in regards to Carson Wentz. PHOENIX – Howie Roseman views his annual trip to the NFL league meetings as the natural transition from free agency to the draft, and the Eagles’ top executive touted how the Birds stayed “true to our beliefs” with their offseason transactions. They focused on fortifying the offensive and defensive lines, and went from there – including keeping cornerback Ronald Darby and adding a playmaker for quarterback Carson Wentz. This approach is consistent with how Roseman has viewed roster building, and might hint at why the Eagles have not placed as much emphasis on running back or linebacker. Roseman was unconcerned about adding aging players and noted how the Eagles also positioned themselves to receive compensatory picks in 2020 because of the way they approached free agency. That’s important because Roseman knows they need young players to surround Wentz in the coming years – and he was outspoken about his desire to sign Wentz to a long-term contract. "It goes without saying that we have a quarterback we’re committed to, that we want to sign to an extension,” Roseman said in his first public comments since the Eagles began changing their roster. The only question for a Wentz extension is when – not if – but Roseman remains elusive about the timing. It might not even happen this year, although every decision and dollar spent must have Wentz’s eventual contract as a consideration. He said that while they feel they’ve added talent this offseason, they also must be realistic that they have a quarterback they “want to pay.” The Eagles’ roster projections with Wentz stretch into the 2020s, yet they focused this offseason on adding players who can help Wentz compete in 2019. Of those players Roseman mentioned, all but Darby are 30 and older. A franchise that once viewed 30 as kryptonite for NFL players is now seeking value with players seemingly past their primes. The five new players added during the free-agency period are Malik Jackson (age 29), DeSean Jackson (32), linebacker L.J. Fort (29), safety Andrew Sendejo (31), and defensive end Vinny Curry (30). Roseman said that teams are doing a better job keeping their in-their-prime free agents, limiting the starting-caliber players on the market. So while Roseman once sought ascending players such as Rodney McLeod, Brandon Brooks, and Nigel Bradham in free agency, he’s now looking at players who might be undervalued because of their ages. He pointed to the Los Angeles Rams making the Super Bowl after adding multiple starters in their 30s. 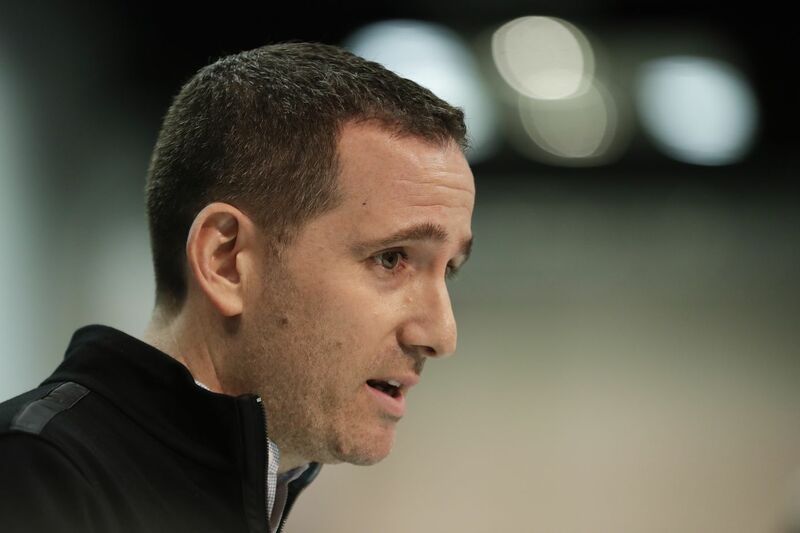 Older players might be more prone to breaking down or declining, but Roseman said that the Eagles considered durability when making the additions. DeSean Jackson is the player who fits this profile. Jackson gives the Eagles a bona fide deep threat who led the NFL in yards per catch last season and three of the past five years. The decision to add Jackson was motivated by the team’s desire for a player “who can stretch the field vertically.” Zach Ertz, Alshon Jeffery, Nelson Agholor, and Dallas Goedert all have big roles in the offense, but Jackson offered an element that had been missing. It wasn’t just apparent when Jackson played for the Eagles. It was also apparent when he was on the other sideline. Jackson averaged 23.7 yards per catch in six career games against the Eagles – the most against any opponent. Although the Eagles’ hole at running back receives the most attention, there’s still uncertainty at linebacker after Jordan Hicks’ departure. Roseman gushed about the addition of Fort, who has only three career starts since entering the league in 2012. The Eagles targeted him in free agency after keeping an eye on Fort all season with Pittsburgh, and Roseman said he’s a good fit in their defensive scheme. They also think Paul Worrilow can help after missing all of last season with a torn ACL. Bradham headlines the group, but the Eagles have invested in the development of Kamu Grugier-Hill and Nate Gerry, too. However, there’s still time to bring in new players. The Eagles might have transitioned from free agency to the draft, but the roster building is far from complete.